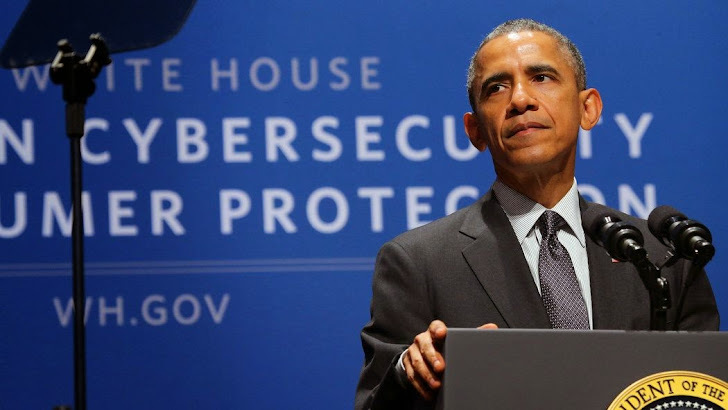 President Barack Obama signed an executive order on Friday that encourages and promotes sharing of information on cybersecurity threats within the private sector and between the private sector companies and the government agencies as well. During his speech at the White House Cybersecurity Summit at Stanford University in California, where many tech leaders and other government officials also assembled, the President highlighted events affecting cybersecurity and the development of the Internet. "The cyber world is sort of the Wild Wild West and to some degree we are asked to be the sheriff," Mr. President told a crowd at the Memorial Auditorium. "When something like Sony happens, people want to know what government can do about it. The technology so often outstrips whatever rules and structures and standards have been put in place." "Everybody’s online and everybody’s vulnerable," Obama stressed. White House believes that the primary means of online security shouldn’t depend on passwords, and we must have some new technologies that combine greater security and convenience to the online users. In order to ensures a user’s security online, the technology must move beyond usernames and passwords. The Obama ‘Executive order’ is meant to establish a framework in efforts to help businesses and government organizations "prioritize and optimize" their spending, and quickly identify and protect themselves against cyberthreats, carried out by both hackers and foreign nations. The framework will also polish communication across companies and organizations to better manage cyber risks. "There's only one way to defend America from these cyberthreats, and that is with government and [private] industry working together, sharing appropriate information." The major companies including Apple, Intel, Bank of America and Pacific Gas & Electric (PG&E) have already committed themselves to the government's new cyberthreat framework. The executive order added the Department of Homeland Security to the list of government organizations that would be able to approve the sharing of classified information and ensure that proper information is shared between the entities. Since 2013, the Obama’s administration has been actively working on this issue, when the president signed a previous executive order on Critical Infrastructure Cybersecurity. That, in turn, resulted in the development of the "Cybersecurity Framework." Obama acknowledged the challenge to protect American citizens from cyber threats, but at the same time protect their right to privacy. He mentioned companies such as Symantec, Intel and Bank of America are going to use the government’s improved Cybersecurity Framework to strengthen their own defenses. Facebook CEO Mark Zuckerberg, Yahoo CEO Marissa Mayer and Google's Larry Page and Eric Schmidt were all invited to the Stanford event, but won't attend, according to the companies. Apple CEO Tim Cook is making an appearance, talking about people's rights to privacy and security. Of course, the news is not great for everybody because this new executive order will reduce legal liability for companies that share too much information of its users. Also, no one can guarantee whether the private sector will be willing to offer this information, as many companies are still reeling from Edward Snowden’s revelations about how the government agencies are using users information to spy on their customers in the US and abroad. A copy of the executive order has yet to be published on the White House website.